Friday 20th January saw the Seamaster 2017 ITTF World Tour Hungarian Open narrow done the number of Men's Doubles pairings to two with Brazil's Hugo Calderano and Gustavo Tsuboi, and China's Fang Bo and Zhou Yu booking their places in the final round of the competition. Hugo Calderano and Gustavo Tsuboi went head-to-head with Hungary’s Nandor Ecseki and Adam Szudi in the last four, in a challenging duel that required five games to settle. Playing with the backing of the home supporters Nandor Ecseki and Adam Szudi put up a brave fight and were able to recover from two games to one down before going on to take the fourth end to force a decider. Unfortunately for the Budapest crowd though Ecseki and Szudi weren’t able to get over the finishing line, and with game five heading to Calderano and Tsuboi the dream of reaching the final became a reality for the Brazilian duo (5-11, 11-7, 15-13, 9-11, 11-6). “We are delighted reaching the second finals in row and congratulations to the Hungarians as well as they had a good tournament too. We know each other’s game with Adam as we practice at the same club hence all the games were very tight and the difference between us was marginal”, Hugo Calderano. Hugo Calderano and Gustavo Tsuboi won the Men’s Doubles title at the 2016 ITTF World Tour Swedish Open in November 2016, can the Brazilians make it back-to-back titles in the category come Sunday 20th January’s final? 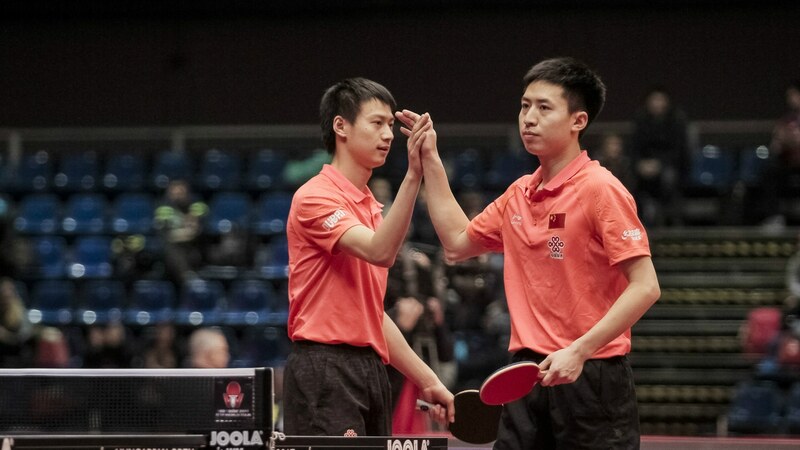 The other pair to make the Men’s Doubles final in Budapest is China’s Fang Bo and Zhou Yu, after the no.5 seeds came back from a losing position to beat the sixth seeds Ruwen Filus and Ricardo Walther of Germany. Filus and Walther made a blistering start to the semi-finals encounter dropping just a single point in the opening game, but Fang and Zhou responded well and turned the tie on its head after they took games two and three to establish a 2-1 lead. Despite their best efforts the German partnership of Filus and Walther would go on to miss out on a spot in the final; the fourth game went to Filus and Walther to put them back into the tie, but a calm display from Fang and Zhou in the final game proved enough to send them through to the final (1-11, 11-6, 11-9, 5-11, 11-8). “We prepared well for this match. We had to be focused all the time as they were unpredictable”, said the victorious Chinese pairing. The Men’s Doubles final will take place on Sunday 22nd January at 14:30 (GMT).